Not so long ago I was telling you about Fresh Player Plugin, a new wrapper that's currently in alpha, which allows Linux users to use Pepper Flash (which is bundled with Google Chrome) in Firefox and other NPAPI-compatible web browsers. Well, in just over a week, Fresh Player Plugin evolved a lot and in my test, I actually didn't encounter any major issues: the sound works, video playback works with YouTube and other websites, full-screen videos work with multi-monitor setups, etc. So I've decided to upload Fresh Player Plugin to the main WebUpd8 PPA so you can test it easily and stay up to date with the latest code from GIT. The development of TrueCrypt was ended in 5/2014 after Microsoft terminated support of Windows XP. Windows 8/7/Vista and later offer integrated support for encrypted disks and virtual disk images. Such integrated support is also available on other platforms (click here for more information). You should migrate any data encrypted by TrueCrypt to encrypted disks or virtual disk images supported on your platform". 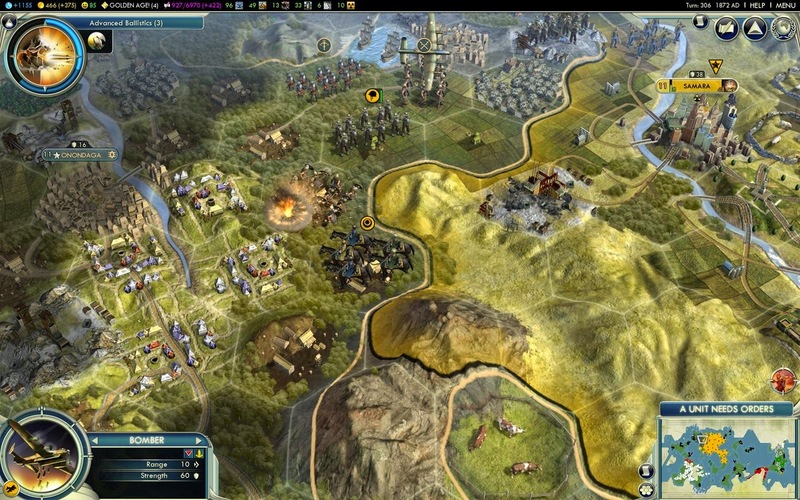 A recent Reddit submission points out that Sid Meier's Civilization V might be coming to Linux soon. Many of you are probably already familiar with the Moka Project but, since I never covered it, and the project has evolved a lot recently, I though I'd write an article about it now. Moka started as a single icon theme but it has evolved into an entire project which includes multiple GTK and icon themes for the Linux desktop as well as icon themes for Android, all designed / developed by +Sam Hewitt. 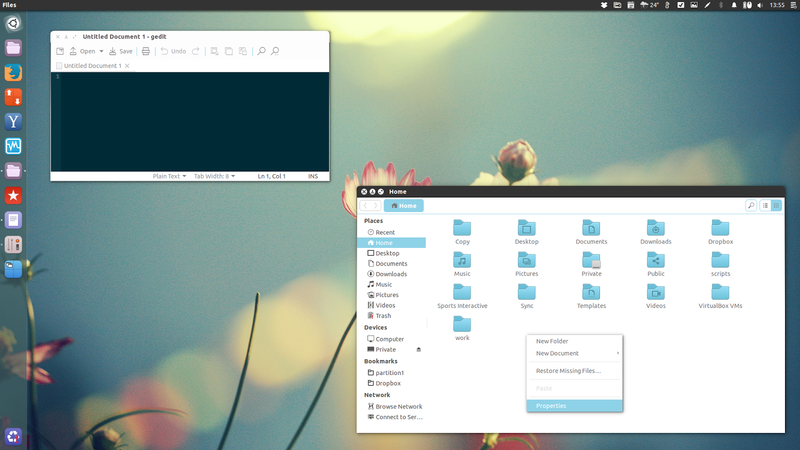 Currently, the Moka Project consists of 3 beautiful GTK themes (Moka, Orchis and Stark) and 3 icon themes (Moka, Faba and Faba Colors) for Linux desktops, accompanied by a GNOME Shell and a Plank theme. 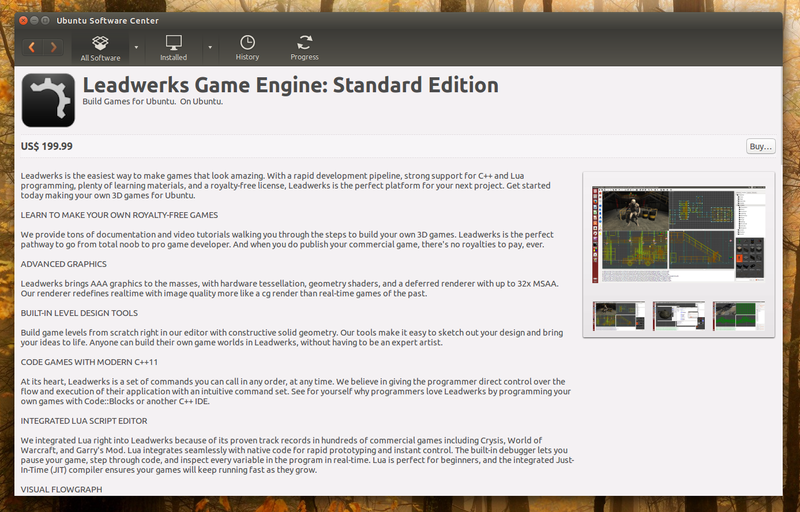 Last year, Leadwerks Software ran a Kickstarter campaign to bring their game development software to Linux. The company raised $42,358 (of the $20,000 goal) so Leadwerks Game Engine is now available for Linux and starting today, you can buy it via Ubuntu Software Center. The Leadwerks Engine is a 3D game engine powered by OpenGL 4.0 which made its debut in 2008. The engine makes use of the Newton Game Dynamics SDK 2.0 for physics and OpenAL and EAX for sound and 3D sound effects. 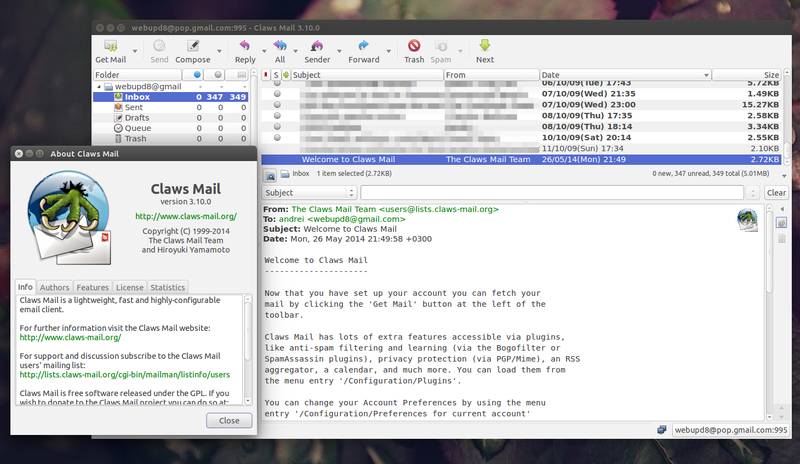 Claws Mail 3.10 was released today with important new features such as auto-configuration of account email servers based on SRV records, so for instance if you enter a Gmail account, Claws Mail will automatically determine the connection details (ports, server names, security protocols, etc.). The new release also includes proper certificate verification, an option to avoid saving drafts for emails that are to be sent encrypted, a new Libravatar plugin which displays user avatars from libravatar.org and more. In 2013, the Mozilla Foundation commissioned Erik Spiekermann, a famous typographer, to work on a free, open source font family called Fira Sans (initially called Feura Sans). Recently, the typeface was updated to version 3.1, getting 12 different weights (bringing the weights number to 16), all accompanied by italic styles, a huge character map and extensive language supports. There's also a monospaced variant: Fira Mono which includes 2 weights (regular and bold). After more than a year and a half, a new Pinta version was released yesterday, getting add-in support along with other new features and a huge list of bug fixes. 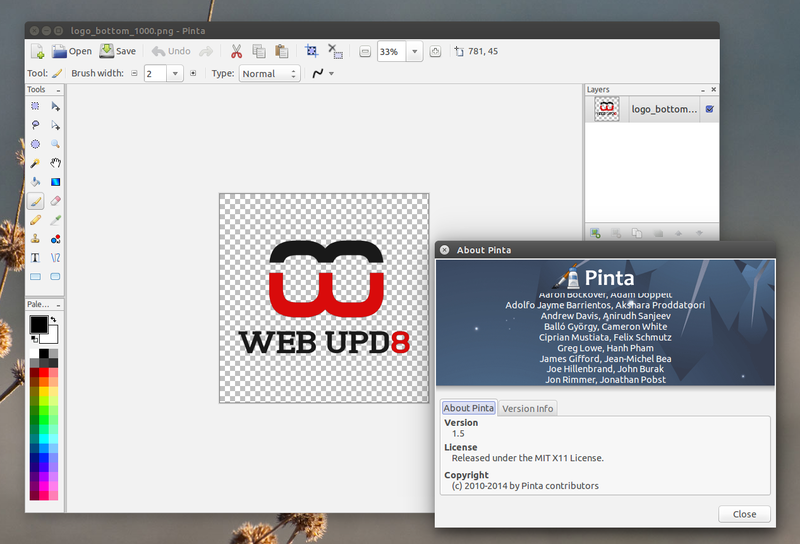 Pinta is a drawing / image editor which was initially based on Paint.NET, available for Linux, Windows and Mac OS X, designed to serve as an alternative to more advanced applications like GIMP, for casual users. The application features drawing tools, unlimited layers and undo history, includes over 35 image effects and adjustments and can be configured to use a docked interface or multiple windows. 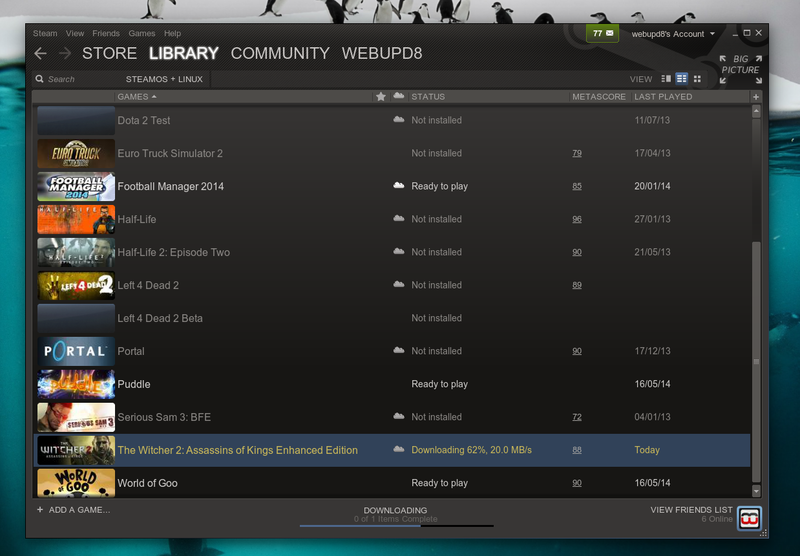 The Witcher 2: Assassins of Kings, is available starting today for Linux users, via Steam (and SteamOS, obviously). If Aptana Studio 3 crashes for you under Ubuntu 14.04, here's a quick fix you can apply to get it to work properly. 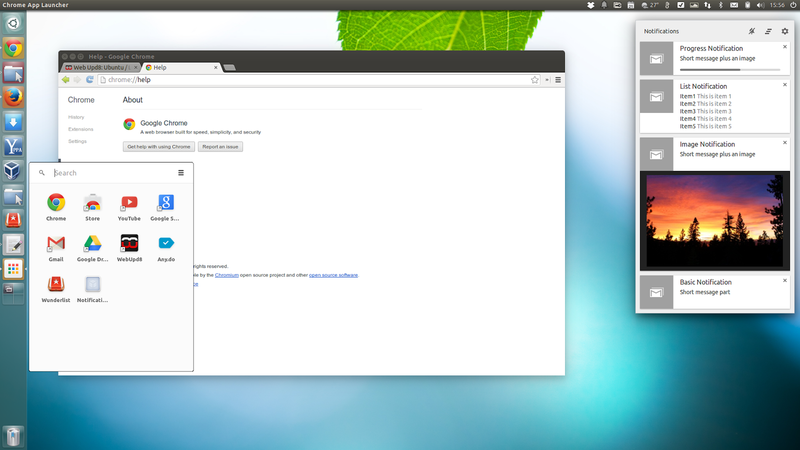 Google Chrome stable for Linux was updated recently (version 35) with important changes: Aura is now used for the user interface (replacing GTK2) and also, a Notification Center and App Launcher were added though the latter is not enabled by default. Spotify is a music streaming service that comes with native clients for Microsoft Windows, Mac OS X, Linux as well as mobile devices such as iOS, Android, BlackBerry, etc. The service is available in quite a few countries, including US, UK, Sweden, Spain, Portugal, Norway, Netherlands and more - see the Spotify Geographic availability @ Wikipedia. 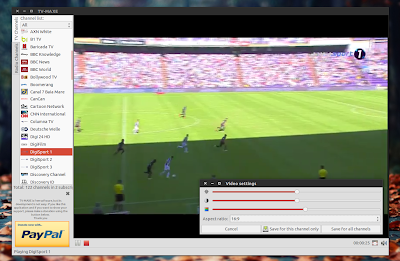 TV-Maxe is an application that allows you to watch TV online via different streams, such as SopCast (but not only). 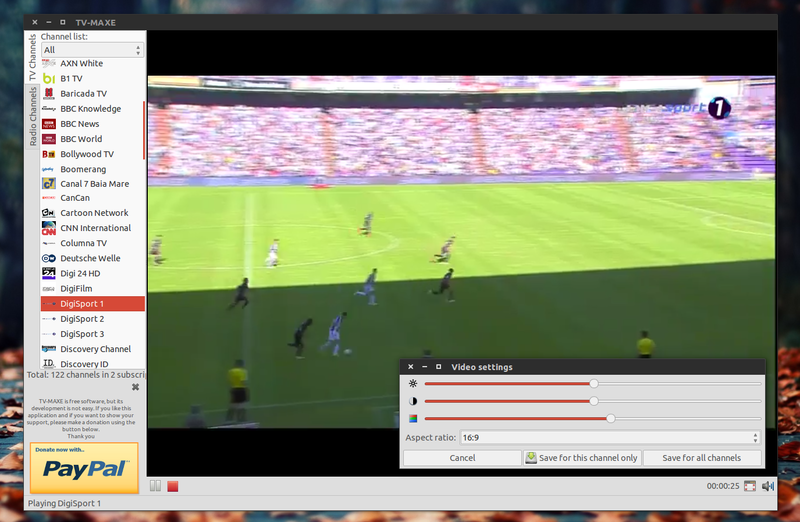 The application features HTTP / infrared remote control support, multiple playback backends (GStreamer, VLC and MPlayer), schedule manager and more. TV-Maxe comes with two TV channel lists be default: an international list and a Romanian TV channel list, but more lists are available on its wiki (for Bulgaria, China, Denmark, Finland, France, Germany, Greece, Hungary, Moldova, Norway, Russia and Spain along with some unofficial lists for UK, France, Brazil, etc.). And of course, you can add custom channels as well. Fresh Player Plugin is a new (alpha!) wrapper that allows Linux users to use Pepper Flash from Google Chrome in Firefox, Opera and other NPAPI-compatible browsers. 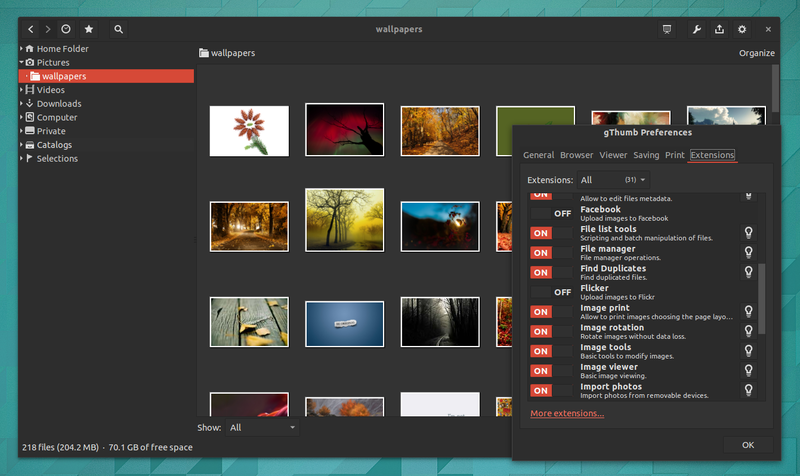 gThumb is an image organizer/viewer that can export images to PicasaWeb, Facebook, Flickr or Photobucket, comes with some basic image editing features such as cropping, resizing, rotation, image enhancing, has video support, supports WebP images, can import images from digital camera and many other cool features. Ubuntu 14.04 had gThumb 3.3.1 in its official repositories at some point but because starting with version 3.3.0, the application uses header bars (also known as client side decorations) and they don't work properly under Unity, gThumb was downgraded to version 3.2.7. 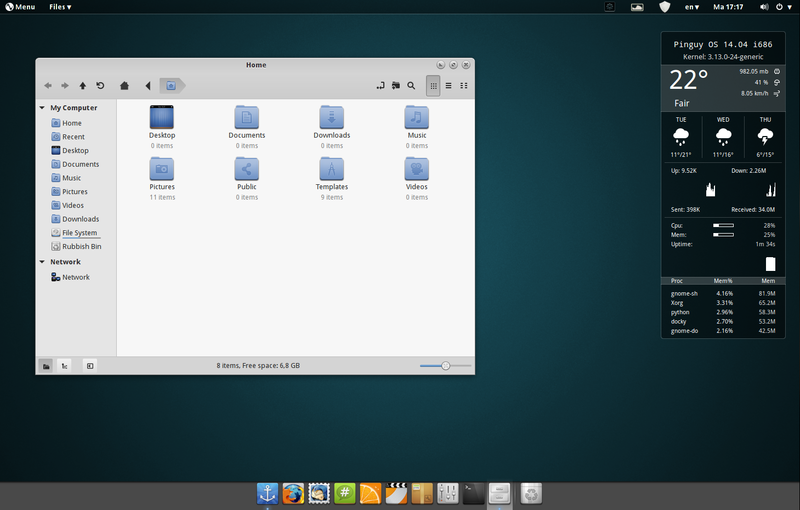 And that's ok for Unity but how about Ubuntu GNOME and Linux Mint 17 (with Cinnamon 2.2.x) users? Well, to make it easier to install, I've uploaded the latest gThumb 3.3.2 in the WebUpd8 gThumb PPA for Ubuntu GNOME 14.04 and Linux Mint 17 with Cinnamon users. 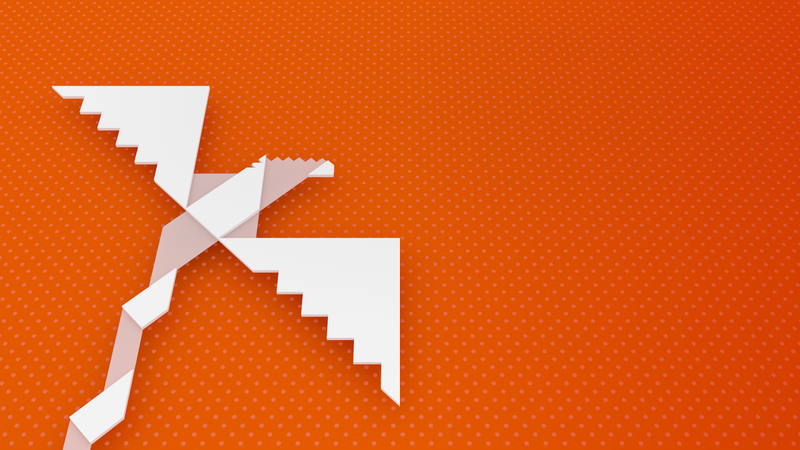 Each Ubuntu release ships with 15-20 beautiful wallpapers created by the community. For every Ubuntu version starting with Karmic (9.10), there's a package that contains all these community wallpapers, which you can install in newer Ubuntu releases. By using the instructions below, you can install all the Ubuntu community wallpapers from Ubuntu 9.10 Karmic Koala to Ubuntu 13.10 Saucy Salamander (138 wallpapers! ), in the latest Ubuntu 14.04 Trusty Tahr. If you don't use Ubuntu or you're using an older release, there's a download link at the end of the article which allows you to download all the wallpapers from Ubuntu Karmic Koala (9.10) to Trusty Tahr (14.04). Wildfire Games has released the sixteenth alpha version of 0 A.D., an open source, historical real-time strategy game which features excellent graphics and sound. The new alpha brings an improved AI, a new GUI along with big changes under the hood and more. 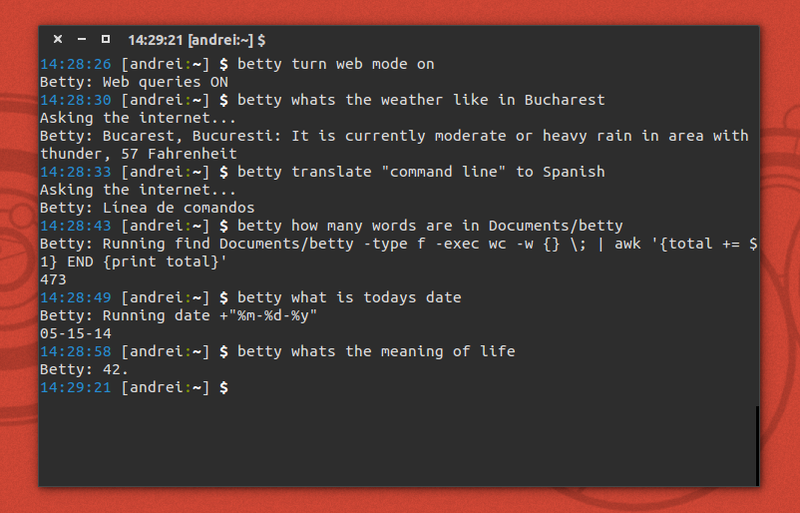 Betty is like Siri or Google Now for the command line. Well, sort of. The tool translates plain English into commands: it displays the command it runs and obviously, the command output, in the terminal. Betty isn't voice controlled so you still have to type your (plain English) commands but if you want, it can speak the command output. Today I've updated the Atom Ubuntu PPA with the latest Atom code from GitHub and, while the application still doesn't work on 32bit, there is some good news: Atom uses dynamic libraries now, so you might be able to use my builds in Linux distributions other than Ubuntu (Fedora, Debian etc.). The new version also comes with quite a few Linux bug fixes. 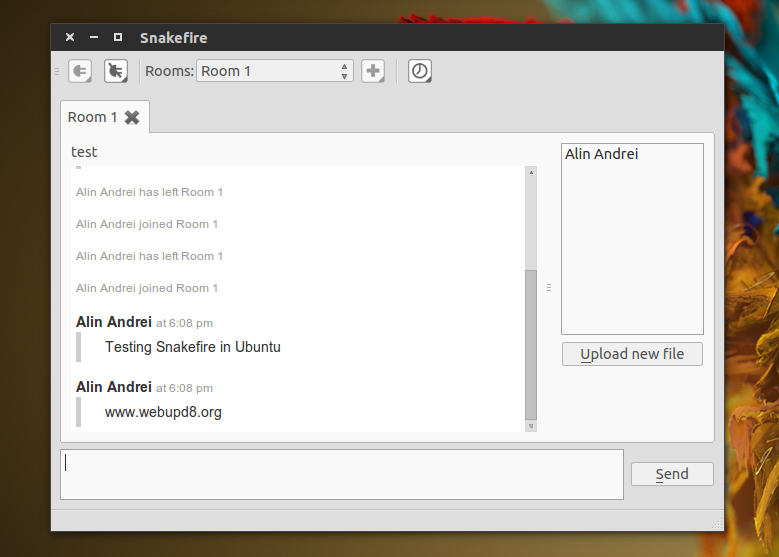 Snakefire is a Qt Linux client for Campfire, a team collaboration tool with real time chat, popular among developers. Because there were no Ubuntu packages for Snakefire, WebUpd8 reader +Rael has created a PPA so you can easily install it and stay up to date with the latest releases. A while back I was telling you that Linux Mint might use the same LTS base for Linux Mint 17 as well as the next 3 releases. Well, Clement Lefebvre, the Linux Mint Project Leader, announced today that the decision was made and indeed, the next 3 Linux Mint releases (and Linux Mint 17, obviously) will stick to the LTS base. 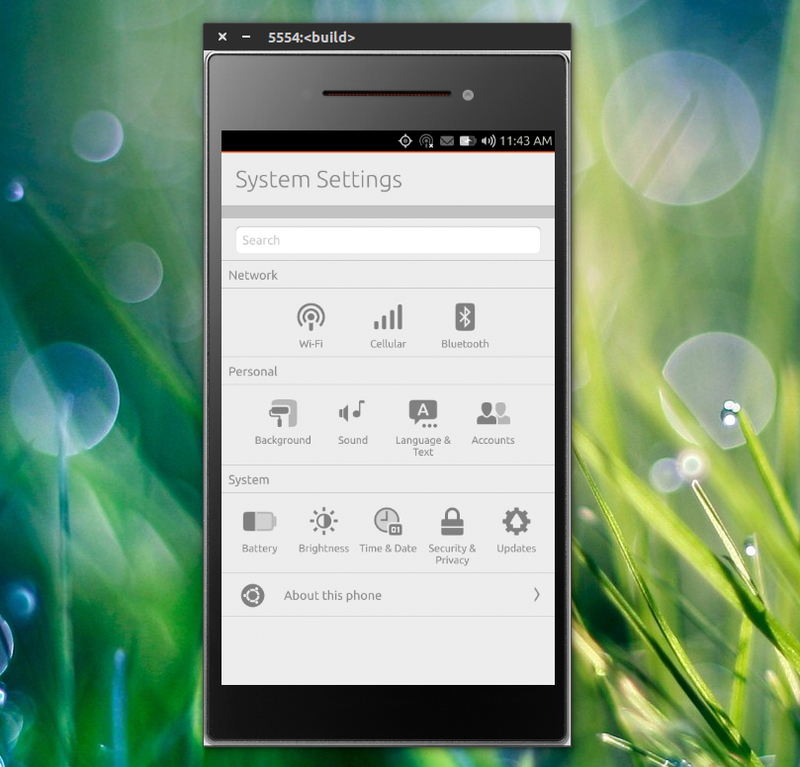 The Ubuntu Touch Emulator package from the Phablet Tools PPA now has x86 support. The ARM instances are very slow but now by using the Phablet Tools PPA, you can create x86 Ubuntu Touch instances which should be much much faster. After releasing the Mini ISO about 2 weeks ago, +Antoni has released PinguyOS 14.04 (full) recently, an Ubuntu (14.04) remaster that ships with many popular applications and tweaks. 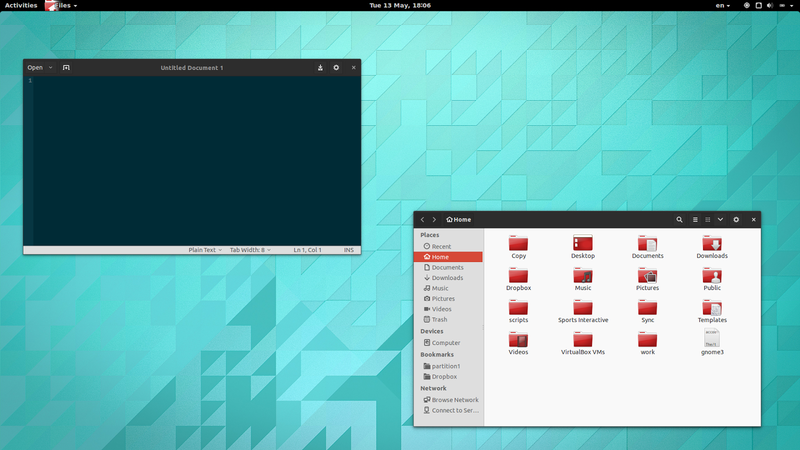 GNOME 3.12 was released a while back but it wasn't included by default in Ubuntu 14.04, so here's how to install GNOME 3.12 in Ubuntu GNOME 14.04. 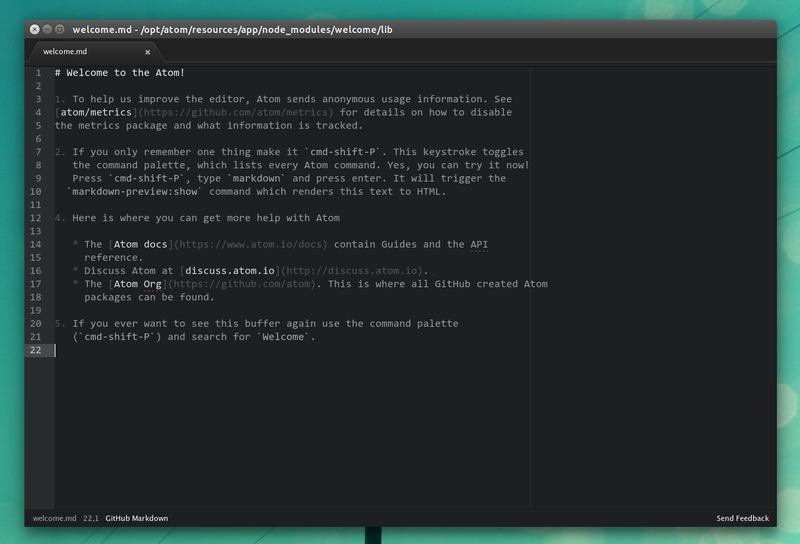 Atom is an open source "hackable text editor for the 21st Century" developed by GitHub. Until now, to use Atom in Ubuntu or Linux Mint you'd have to compile it but I like to make things easier for you so I've built it on my computer (Nodejs apps can't be built directly in Launchpad PPAs because they need to install external dependencies and Launchpad doesn't allow that) and uploaded it to a PPA, for Ubuntu and derivatives: Linux Mint, elementary OS, etc. 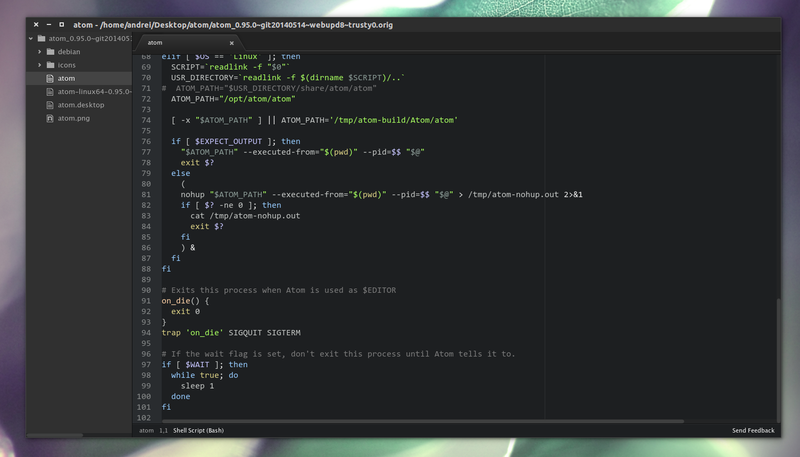 Update: initially, Atom could only be built on 64bit (on Linux), but it's now available for both 32bit and 64bit! Update 2: The Atom devs are now providing Atom 64bit DEB packages @ GitHub. Update 3: There are now official Atom 64bit RPM packages available for download. Pushbullet is a service that lets you easily send files, links, notes, lists, etc. to your Android or iOS device from your desktop or the other way around. 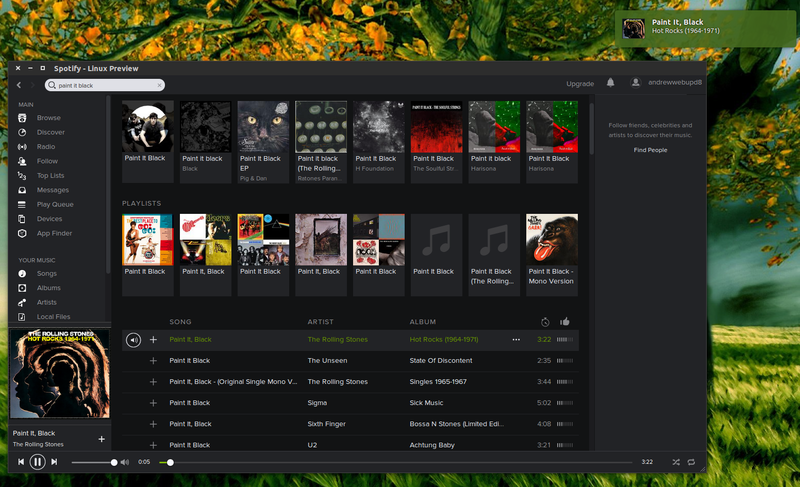 It can be used via Chrome / Firefox extensions and for Windows there's also a desktop app. Because there was no Pushbullet application for Ubuntu, Lorenzo from atareao.es (you may already know some of his work: My Weather Indicator, Calendar Indicator, Touchpad Indicator, Nautilus/Nemo image tools, etc.) 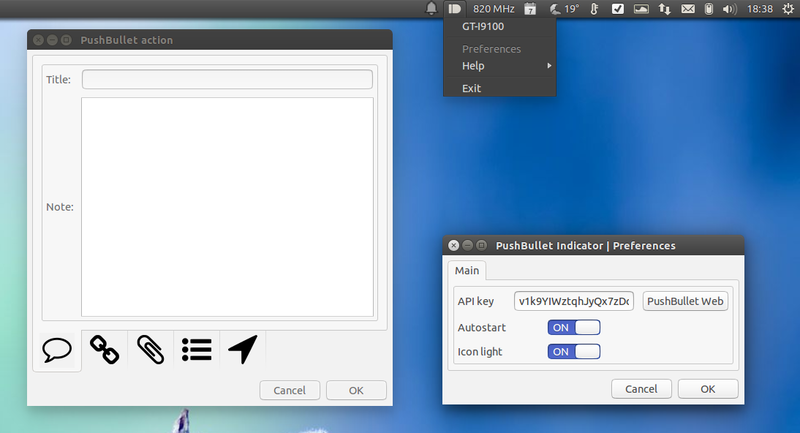 has created a Pushbullet AppIndicator for Ubuntu. Sysmonitor Indicator is an Ubuntu AppIndicator that can display the CPU, memory, swap, filesystem and network usage as values on the panel. Furthermore, the AppIndicator comes with a very interesting feature: it can display the output of your own custom commands / bash scripts on the panel. The AppIndicator wasn't updated in a long time and it was buggy, at least in Ubuntu 14.04, so fossfreedom forked it, fixed the bugs and uploaded Sysmonitor Indicator to a PPA. Update: the indicator also works in Ubuntu 16.04 and 16.10. Quick tip for GNOME/Unity users: If you want to add a delay to a startup application, the easiest way to do it is to add the "X-GNOME-Autostart-Delay" parameter to the application autostart desktop file. 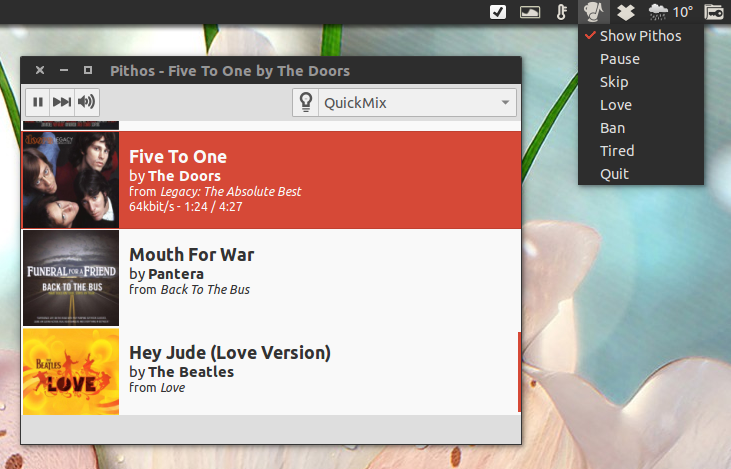 Pithos, a Pandora.com Linux client, was updated to version 1.0 recently. 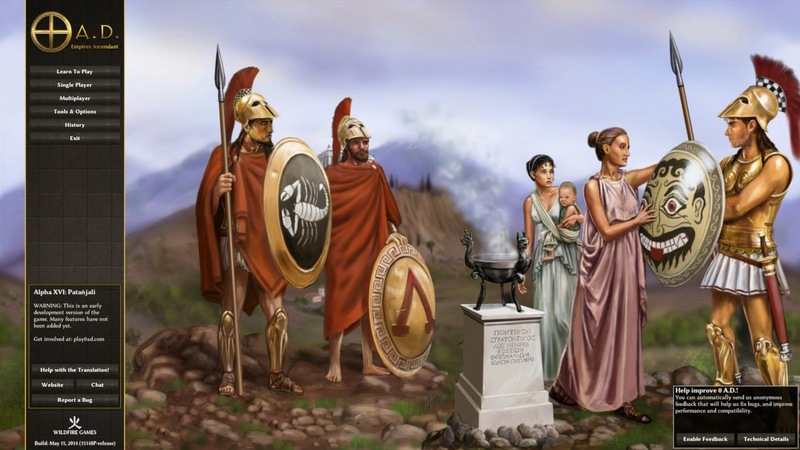 With this release, Pithos was ported to Python 3, GTK3 and GStreamer 1.0 but that's not all that's new - there are also some new features as well as a new app icon. Pandora is a music streaming and recommendation service that's only available in the United States, Australia and New Zealand. You can use it in any other country with an US proxy, VPN or a DNS service such as Unlocator (for free alternatives, see the comments). 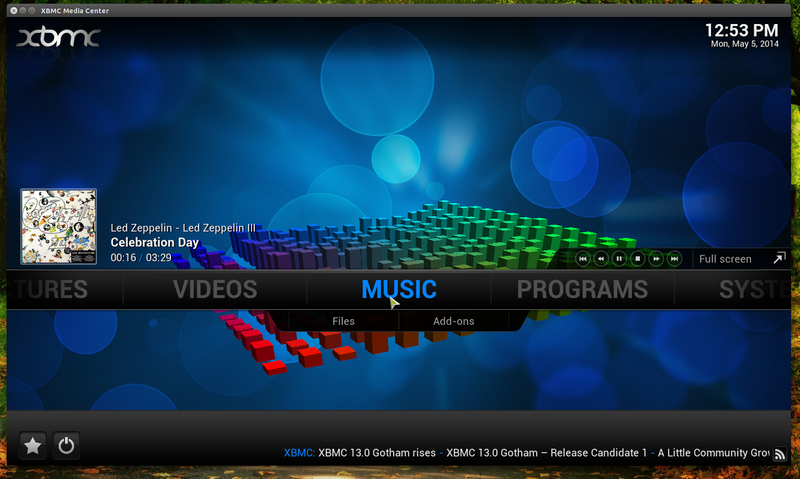 XBMC Media Center 13.0 "Gotham" was released yesterday, bringing improvements across all platforms, such as hardware decoding on Android, proper PulseAudio support for Linux, improved settings, support for some 3D movie formats and more. Update September 2, 2014: Canonical released Ubuntu Developer Tools Center which can be used to easily install Android Studio and Android SDK in Ubuntu. 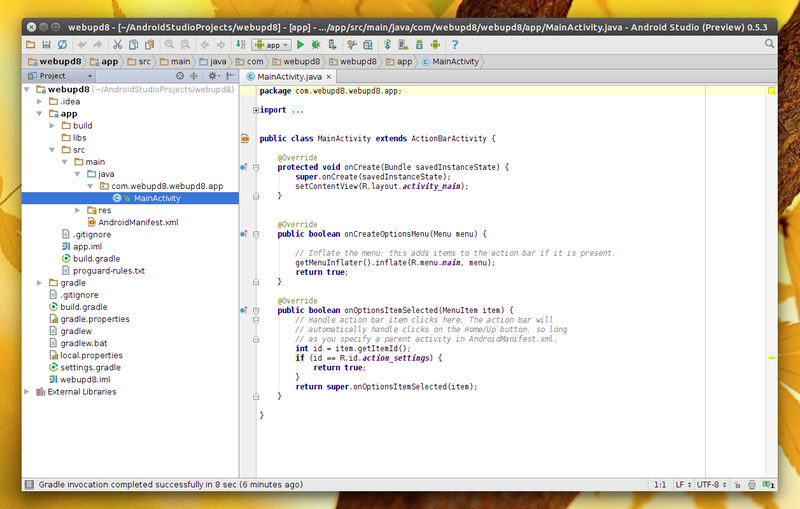 That's the official, supported method of installing Android Studio in Ubuntu now! Google provides Android Studio for Linux as a simple archive which you must download, extract, create your own launcher and so on. To makes things easier, +Paolo Rotolo has created an Android Studio PPA for Ubuntu and derivatives (Linux Mint, elementary OS and so on). Ubuntu 12.10 (Quantal Quetzal) reaches end of life on May 16 2014.